A man has been jailed for life for murdering a war veteran at his home in Greater Manchester. Widower Frank Worsley, 87, died almost three weeks after Daniel Crompton attacked him as he burgled his home in Bolton on 3 August. Crompton, 24, of no fixed address, denied murder but admitted robbery and two counts of burglary. He was found guilty by a jury at Manchester Crown Court and ordered to serve a minimum of 18 years in prison. Judge Mr Justice Turner told Crompton his actions were "as brutal as they were cowardly". The court was told Crompton had been taking drugs and drinking and had run out of money. Police said he broke into Mr Worsley's house in Longfield Road, Daubhill, by climbing up a drainpipe and getting in through the bathroom window. Mr Worsley was asleep in bed when he was woken by Crompton demanding money. Crompton repeatedly punched Mr Worsley in the face and head, police said. He then stole his bank book, wallet and cheque book and fled. Mr Worsley, who lived alone, later suffered a stroke as a result of the blows and died in hospital 17 days after the attack. Crompton admitted the burglary at Mr Worsley's home at an earlier hearing, along with another burglary earlier the same night. 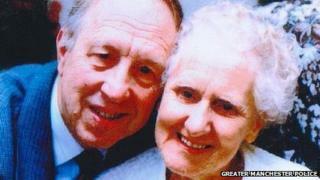 Mr Worsley's family said in a statement after sentencing they were "very pleased" with the verdict. However, they said they would never recover from "this traumatic loss". The family said Mr Worsley had been a carer for his wife Mary, who suffered from multiple sclerosis and died 11 months earlier. "We could be more accepting of his death if it had been of old age - peaceful and dignified," the family said in a statement. "Instead it wasn't peaceful, he wasn't comfortable; he was scared, agitated and distressed as a result of this callous attack." Crompton was given 18 months for two counts of burglary to run concurrently.